Joanna & Jan: Martina, thanks a lot for your help at our arrival. La Rocca was peaceful at that time of a year, just like all Tuscany. We admired our stay in La Rocca, with a beautiful garden and a view from the hill, with its scent of lavender and rosemary. It was a time of our life and we can recommend the place to everybody who loves beauty and wants to rest far from turmoil and crowds. per i futuri clienti: If you like visiting, this was a perfect time of a year. Temperatures 20 - 24oC, gentle sun and just warm. Not too many tourists (with the exception of Florence - always crowded), you can easily travel by car and find a parking space in a reasonable time. Sanne & Morten Nordahn (Denmark): Warm and heartfelt thanks for your friendliness and professionality with regards to coordinating our wedding party at La Rocca. It is truly a wonderful place to gather friends and family. Our dreams about the wedding came true in abundance. And thanks for your flexibility in accomodating our special wishes. per i futuri clienti: We gathered friends and family at La Rocca. A total of 22 adults and 10 children occupied the entire structure and stayed together for 3 days (fri-mon), with the wedding party on saturday. It was a wonderful way to celebrate that we finally got married. 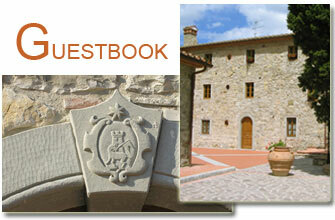 We and all of our guests where in awe of the view and the Tuscan spirit of the place. The party itself plus brunch and dinner on sunday was arranged and coordinated by Martina with great warmth and professionality. We sincerely recommend La Rocca, be it as a couple looking for a wonderful getaway with a stunning panoramic view (Melograno is particularly nice) or as a larger group looking for a wonderful place to get together. zwygart: thanks a lot for your welcome even so late in the nigth. To wake up here with the view was a present to start very nice holllidays after a so long way by car from Paris. we will very glad to talk about your place to all our friends. the diner every wednesday is a very good idea to meet other people may be you can help simply asking every one to tell where they are coming from and propose a big table to gather everyone like a " table d´hôte". the other point is to easier the fact than it´s so nice to take breakfast or diner and to carry things downstairs is not so easy. per i futuri clienti: you can find a very peacefull place here with a wonderfull view. you´ll be sureley welcome and have nice time holidays. we´ve gone to visit Florence, Pise, Pistoia, Lucca Viareggio... you need a car and time ! the diner every wednesday is a very good idea to meet other people.